Preparing and packing for an upcoming workshop at Arrowmont, taught by Kerr Grabowski and myself. I have always had my students tape their screens and now I am questioning why? I was looking at my silkscreens. Most have been taped with duct tape. Some were in dire need of repair. After removing the the tape, which is a very sticky mess and not easily removed, I tried many goop removal products, but stopped at Xylene. 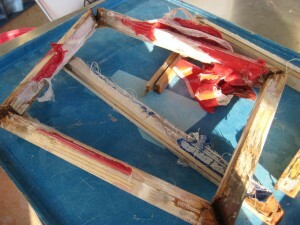 The wooden frames were rotting or already rotten. I know the screens won’t last forever but it occurred to me that returning to the old school way of painting the wood and wells with shellac or polyurethane or acrylic paint will lengthen the the life of the wood. To seal the space between where the silkscreen meets the wood I used Liquid Nails. There is a smaller tube available so you don’t have to use the large caulking gun. The next time you buy or have to repair a silkscreen, may I suggest sealing with paint instead of tape.